by Chris Woodford. Last updated: November 23, 2018. Everyone likes a bargain, but you have to wonder about a T-shirt that costs only five dollars. How is it possible for someone to grow the cotton, harvest it, make it into a shirt, transport it, sell it on to a retailer, and still make a profit for a price like that? The answer should be blindingly obvious, but we choose to ignore it. Cut-price clothes and food are all too often produced by exploiting people in developing countries, who make the cheap goods we've come to love by working long hours for low pay, often in appalling conditions. We try not to put up with this in our countries, but when the label says "Made in India" or "Made in Chile", we conveniently push it to the back of our minds. Fortunately, many people are waking up to the basic unfairness of world trade and demanding a better deal for the people who do our dirty work. It's called fair trade. Let's find out why it's important and how it works. Photo: Fair trade tea, coffee, sugar, and chocolate. You can find the FAIRTRADE mark on every one of these products; it means, wherever possible, the ingredients are fair trade. But what does that mean in practice... and how can you be sure the workers were treated as fairly as you'd expect? And these are some of the less extreme examples, before we even start talking about child labor and sweatshops. That's another way of saying "out of sight, out of mind." 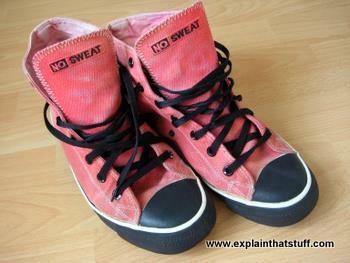 Photo: Brands like NO SWEAT are rejecting unfair, sweatshop labor. Unlike some footwear brands, these sneakers were made by trade-union members who earn a decent wage and work in good conditions. Why "free trade" often means "unfair trade"
Globalization—the tendency of companies to treat the world as one giant kingdom of potential profit, without all those pesky borders—is largely to blame. If a company can sew its jeans in Honduras for a fraction the price it can do it in Chicago, the decision to outsource is a no-brainer. And if competitors have already packed their factory bags and cut their costs, and you hold out for "Made in the USA" and higher prices, guess where your business might be heading? Free trade is a part of globalization and it sounds great in theory: if we removed all barriers to trade, such as import tariffs (the taxes companies have to pay to get their goods into another country and sell them there), all countries could compete on a level playing field—and what could be fairer than that? In practice, it doesn't work out quite like that. Some countries are inevitably far more powerful than others and they want things to stay that way. Even while promoting "free trade", they use all kinds of tactics to ensure they can trade more freely than other people. According to advocates of globalization, free trade has brought greater wealth to people in poorer nations, giving them a foothold on the ladder of progress and prosperity. On that view, wealth gradually "trickles down" society from the richest to the poorest, making everyone's lives better in the long run. The trouble is that very often it doesn't. Big corporations haven't outsourced their operations to low-wage economies in developing countries through any desire to alleviate poverty; they've done it to keep prices down and compete in a marketplace where everyone else is outsourcing too. Now there are many good examples of companies working respectfully with partners in developing countries, providing fair prices that help communities gain access to such vital things as education and basic healthcare. But there are many more corporations supporting a shadowy world of sweatshops, where working conditions are appalling and wages are too little to meet even basic daily needs, never mind climb out of poverty. Unchecked, globalization swiftly becomes a "race to the bottom." If "trickle-down" theory works, why are so many of the world's people still in poverty? 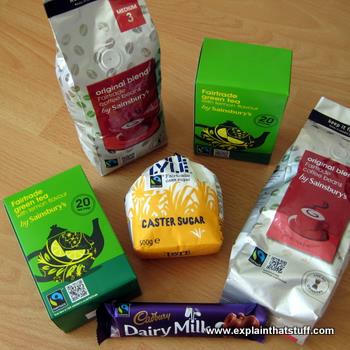 Photo: Fair trade goods have to be properly labelled through a recognized licensing scheme such as the FAIRTRADE mark, licensed by the Fairtrade Foundation. Fair trade is a different system that starts from the premise that workers lives have a value; this social benefit is partly what you pay for when you buy something. Fair trade doesn't just means farmers and producers receive more money so they can support their families in the short term—though that's vitally important. It also means they work under long-term contracts so their communities have enough security to invest in improvements both to their businesses (with more land or animals or better machinery) and their societies (with things like schools or health clinics). Typically, fair-trade producers are small cooperatives of workers using no child or forced labor, using organic or environmentally sustainable methods, and having high standards of animal welfare. Workers are free to join unions and bargain collectively to help improve their lives. Typically, fair trade producers sign up to some sort of labelling scheme that guarantees things have been made under good conditions. You can read some typical standards from the Fairtrade Labelling Organizations and from OneVillage (a UK-based retailer of artisan goods from developing countries and a long-established pioneer of fairer trade). Is fair trade as good as it seems? "Fair trade pays a premium, but on a global coffee price that remains catastrophically unfair to the coffee farmers." Fred Pearce, Confessions of an Eco-Sinner, 2008. Fair trade sounds brilliant—and it's now very big business. In the UK alone, which remains the largest international market, annual sales of fairtrade products grew by around 8 percent between 2017 and 2018; the total topped GB£1.65 billion (~US$2.1 billion) in 2016, up from GB£1.32 billion (US$2.1 billion) in 2011. In the first decade of the 21st century, the UK saw massive growth in retail sales of fairtrade coffee (+944% since 2001), tea (+136% since 2001), wine (+128% since 2004), and flowers (+511% since 2004). But fair trade is not without its drawbacks. One obvious problem is that fairly traded goods can cost significantly more; though the difference between a fair-trade candy bar and an ordinary one is often marginal, fair-trade clothes or household items can be significantly more expensive than goods traded in the usual way. Many people, especially those struggling on low incomes, cannot afford to pay the difference—which is perhaps a bit ironic: if fair trade really is purporting to help poorer people and make the world more equitable, shouldn't it be aiming to help poorer consumers as well as poorer producers? Do we care about poverty in our own countries? Unless it reaches mass markets, there's a danger that fair trade remains a token gesture, more about making middle-class, liberal-leaning consumers feel less guilty than about fundamentally reforming the relationships between producers and consumers. If you return home from the store with a bag of fair-trade coffee in your shopping, and feel good about it, maybe you won't worry that the other 99 percent of your shopping has been produced by dubious, unfair trade practices? While some grocery stores (such as the UK's Co-op and Sainsbury's) have embraced fair trade in a very big way, and apparently quite sincerely, others have used it to suggest they're perhaps more ethical than they really are. 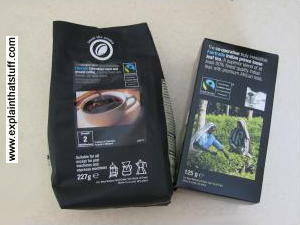 Photo: Fair trade coffee (left) and tea (right) sold by The Co-op, one of the UK's leading fair trade retailers. OneVillage promotes its products as a step "towards fairer trade"; ultimately, that's perhaps the only honest approach. Buying fair-trade products is almost always preferable to buying (implicitly unfair) alternatives, but it's only a starting point. Trade is about long-term relationships, not just between producers and consumers but between entire countries and regions of the world. Achieving truly fair trade means seeing the world in a different way, as a planet of partnership and mutual prosperity rather than plunder and exploitation. Fair trade is not about paying 50 cents more for your coffee; it's about caring for your "neighbors"—even when they're on the other side of the world. Photo: Fair trade? 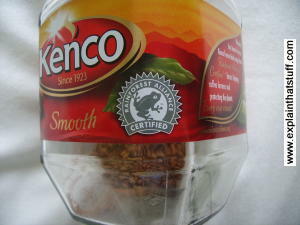 This jar of Kenco coffee doesn't describe itself as "fair trade" but carries the Rainforest Alliance Certified logo, promising it's "helping coffee farmers and protecting the planet" when you buy it. That's certainly an improvement on ordinary, commodity coffee, which makes no promises at all. Even so, critics have charged that the Rainforest Alliance program falls short of other fair trade initiatives. One of the lesser known disadvantages of ecolabelling is that it can mislead consumers by oversimplifying: just because one product loudly claims to be good, it doesn't automatically follow that its competitors are bad. Fair trade products are a good example. The basic concept of "fair trade" is to guarantee a minimum price for commodities, such as tea, coffee, and sugar, so workers in developing countries are paid more than they would otherwise earn. When commodity prices fall, they're still paid the guaranteed minimum price for their products, so they have a basic safety net against poverty. That's the theory, anyway. It sounds like a great idea and it's a sentiment virtually everyone would endorse—but unfortunately it oversimplifies things. Take "fair trade" coffee. If the price for which ordinary coffee (also called "free trade" or commodity coffee) is bought and sold is relatively high, it will exceed the guaranteed fair trade price. Under fair trade rules, that means the coffee growers are paid almost exactly the free-trade price (with a very small premium on top)—so they're being paid virtually the same as if they were selling ordinary commodity coffee in the first place. They don't lose out when prices fall, but nor do they really gain when prices rise, as you might expect. So, when commodity coffee prices are high, you, as a consumer, are still paying a premium in store for your "fair trade" coffee, but it's perfectly possible that the growers are being paid virtually the same as ordinary coffee growers. Who benefits? Most likely, the importers, the big grocery stores, the main-street coffee shops that loudly boast about their "fair trade" coffee to make you feel good (even though 90 percent of the coffee they sell is probably not fair trade anyway), and absolutely everyone in the middle of the chain. Who doesn't benefit? The growers (who earn no more) and you, the consumer (who pay more to give no more to the growers, but receive a product that is no better in quality than basic, commodity coffee). This doesn't mean to suggest that "fair trade" has no value—it's a hugely important step toward recognizing and correcting the unfairness of trade with developing countries. The point is simply that there are flaws in the "fair trade" system and we shouldn't be afraid to look for something better. Photo: Direct trade: This delicious chocolatey coffee from Fazenda Floresta is directly traded by its farmers, who earn twice as much as they would by selling it as "Fairtrade" coffee. It's also organic, biodynamic, and far superior in quality to most "Fairtrade" coffee. 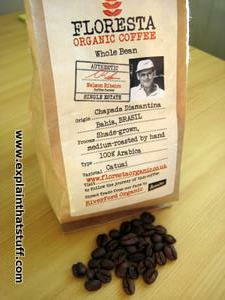 It's supplied by Nelson Ribeiro from his farm in Chapada Diamantina in Bahia, Brazil. Read all about it in Andrew Purvis's excellent article from The Guardian. Many people (and larger stores) opt to buy only "fair trade" coffee, rightly determined to do their bit to fight world poverty. In so doing, they've automatically rejected other coffee not labelled as fair trade and, in their own mind, deemed it "unfairly traded." But how fair is that? An increasing number of small coffee suppliers in regions such as North America and Europe now use an alternative buying model called direct trade, where they purchase sacks of coffee directly from farmers in tropical countries. Since they're cutting out the middle-men, they can often pay substantially more for the coffee than they would either for fair trade or commodity coffee. Usually, small suppliers sell to discerning buyers who happily pay a premium for the very best coffee, so direct trade also helps to raise the standard of what's grown and drunk. Direct trade isn't "fair trade"—it doesn't carry a "fair trade" label. But arguably it's much fairer all round: for the coffee growers (who are sometimes paid substantially more), for the importers (who earn more and are more likely to develop rewarding, long-lasting relationships with their suppliers), and for the consumers too (who get a higher-quality product, for a similar price, and have the knowledge that workers have been paid fairly). The main problem with direct trade is that it's a very new model and currently only vaguely defined: unless you know exactly how much growers have been paid, can you really sure they've been paid a decent amount? Some coffee suppliers are now using independent certification—and even publishing the prices they pay—to try to reassure their customers that direct trade is transparently fair. Why are foodies turning their backs on Fairtrade? by Julian Baggini, The Guardian, February 23, 2015. Explores the continuing shift away from fair trade to direct trade. Fair Trade for who? A counter view to the Fair Trade Debate: Another advocate of direct trade, Steve Leighton of Has Bean Coffee, considers the pros and cons of fair trade. Steve's Ethical Policy is a little bit different. Counter Culture Coffee: Purchasing Principles: One leading coffee firm's explanation of why they trade directly. EthicalCoffee.net: Direct Trade (and direct trade without capital letters) coffee: What is direct trade and how does it differ from fair trade? Green America: Runs a campaign to end sweatshops throughout the world. Fairtrade Foundation: An organization that certifies fair trade products in the UK and raises awareness of fair trade issues. Fairtrade Labelling Organizations International: Fairtrade labelling standards around the world. Global Exchange: Building fairer links across the world. No Sweat: Retailer of footwear and clothing made by workers in decent conditions. Behind the Brands: UK based aid and development agency Oxfam Trade applies some fair-trade pressure to leading food brands. Traidcraft: Christian fair trade organization based in the UK. OneVillage: UK-based pioneer of artisan-made craft goods produced through fairer trade. Website includes a discussion of whether fair trade is always as fair as it seems. You Ask, They Answer: TraidCraft: The Christian trading organization answers direct questions about fair trade posed by concerned Guardian readers. Fairtrade beans do not mean a cup of coffee is entirely ethical: Dan Welch of Ethical Consumer shows that buying fair trade needs slightly more thought than you might think, in this Guardian Green Living blog post. Fairtrade is accused of doing less for coffee farmers than Starbucks: Simon Bowers summarizes a very critical report from the Institute of Economic Affairs (IEA). Fairtrade only really benefits supermarkets. A rethink is needed by Ndongo Samba Sylla, The Guardian, 5 August 2017 and Fairtrade is an unjust movement that serves the rich by Ndongo Samba Sylla, The Guardian, 5 September 2014. Also read the Fairtrade response to Guardian article on "Fair Trade Scandal" from the Fairtrade Foundation. New research finds Fair Trade is a distraction, not a solution, Institute for Economic Affairs Press Release, November 2010: A summary of a report claiming "research shows that fair trade is not a strategy for long-term development—conventional trade is often more effective." Is fairtrade really fair by Sameh El-Shahat, The Telegraph, September 2008: Argues that "fairtrade is totally unfair, keeping Africa poorer while keeping our conscience clearer". In Defense of Globalization, Free-Trade and Free-Market, by David Storobin, Mercy Corps/Global Envision. January 31, 2005. The argument for free trade, BBC News, February 2003: A short summary of how free trade brings benefits to the world. Globalization and Developing Countries, by Aaron Lukas, Cato Institute, June 2000. A robust defense of the benefits of free trade: "From rising wages to improved working conditions, the competition and cooperation that accompany liberalization are proving to be powerful forces for good." The popularity of Fairtrade in the UK by Kirsty Cooke, Kanatr UK Insights, February 26, 2018. Latest figures on the UK fairtrade market. Can B Corp be the next Fair Trade for socially-minded corporations? by Marc Gunther, The Guardian, January 7, 2016. A new form of corporate certification rates companies on their impact on the environment, workers, customers, community and governance. Fair Trade for the Global Garment Industry by David Welsh, The New York Times, May 20, 2015. Welsh argues that the big brands are responsible for basic worker welfare, wherever they choose to make their clothes. Starbucks employees see the graft before the grind by Patrick Collinson, The Guardian, November 2010: Describes how the world's biggest fairtrade coffee buyer is sending some of its staff out to coffee farms. Embroidered T-shirt. Price: £4. Cost: Misery, BBC News Magazine, June 2008: How child labor helps retailers to keep prices down. I was wrong about trade by George Monbiot, The Guardian, June 2003: How free trade can become fairer trade. Inside China's sweatshops, by Lucy Ash, BBC News, July 2002: Exploring the problem of cheap labour in China. Spotlight on Indonesian sweatshops, BBC News, March 2002: The hidden misery behind the goods we love. Take a step for Fairtrade: This 2.5 minute video advertisement from the Fairtrade Foundation simply summarizes the benefits of fair trade. Fair Trade: Improving Lives: Paul Rice, President and CEO of Fair Trade USA, sets out the need for fair trade and the benefits it brings. Scottish Parliament: Fairtrade Debate: Scottish MSPs debate and discuss fairtrade issues in a live debate recorded in February 2012. This is a much longer video and a much deeper look at the issues. The Fair Trade Scandal: Marketing Poverty to Benefit the Rich by Ndongo Samba Sylla. Pluto, 2014. Do all the good words about fair trade actually deliver fairness where it counts, in developing countries? Confessions of an Eco-Sinner: Tracking Down the Sources of My Stuff by Fred Pearce. Beacon, 2008. A well-known science and eco-journalist tracks fair-trade coffee, organic cotton, and much more back to its source, questioning whether feel-good environmentalism really does help the planet. ↑ Reform of US cotton subsidies could feed, educate millions in poor west African countries, Oxfam International press release 22 June 2007 (via Wayback Machine). ↑ Chilean fruit-picking workers' story, Oxfam International campaign page (via Wayback Machine). ↑ Floriculture: Pesticides, Worker Health & Codes of Conduct, Pesticide Action Network Updates Service (PANUPS), June 12, 2002; Dread of Roses: Neurobehavioral Effects Found in Children Exposed to Flower Pesticides by Scott LaFee, UCSD Press Release, May 10, 2017; Say it with organic flowers by Andrew Korfage, Green America. ↑ Sweatshops: What to know, Green America briefing. FAQs About Smartphone Sweatshops, Green America, Retrieved 28 Nov 2017. ↑ [PDF] Guide to Ending Sweatshops, Green America. This old 32-page briefing is still worth reading (via Wayback Machine). ↑ Sweating over sweatshops, Mark Engler, New Internationalist, November 2006. ↑ "Fair trade: At least that's what they say", OneVillage.org. ↑ Shoppers supporting fairtrade, Fairtrade Foundation, 27 February 2017. Shoppers stand behind fairtrade through tough grocery market, Fairtrade Foundation, 29 February 2016. The figures for 2011 come from Responsible capitalism? new fairtrade figures show business is changing for good, Fairtrade foundation press release, 27 Feb 2012 (via Wayback Machine). ↑ Facts and figures on Fairtrade. Estimated UK fair trade retail sales by value 2002–2012 (via Wayback Machine).